Having exhausted Victory's regular catalog of beers (and most of their seasonals...), I set about sampling their irregular catalog of beers. This one appeared out of nowhere. No fanfare, just a new Double IPA on tap at the brewery. With a cryptic name. As it turns out, this is a 100% Cascade hopped beer. Victory sourced the hops for this beer from a family owned hop farm called the Segal Hop Ranch (i.e. Ranch S), apparently the first hop farmers to commercially grow cascade hops (starting back in the late 1960s), so these folks ain't fooling around. In an interesting Victory blog post a while back, one of the Victory brewers recounted his visit to the farm, talking about the Cascade Hops (which are apparently also used in Hop Devil) as well as Citra and then there's this intriguing tidbit: "During the visit, the Segals showed me an unnamed experimental hop they are growing that had a fruity aroma with notes of banana and vanilla." Well that sounds interesting, but I'll have to make due with this Cascade single hopped double IPA for now. I picked up a growler of the stuff a couple weeks ago and ended up drinking the whole damn thing that weekend. 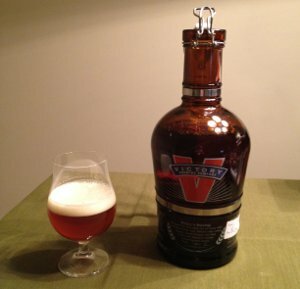 Incidentally, Victory's growler filler machine thingy is absolutely badass. Beer Nerd Details: 9% ABV growler (2L), filled on 12/30/11. Drank out of a tulip glass on 12/30/11 and 12/31/11. I have no idea if this beer will return (I went to the brewery again this past weekend and they were already out of this) or if Victory has bigger plans to bottle this or something, but I'm glad I got to try some, as I enjoyed it greatly. 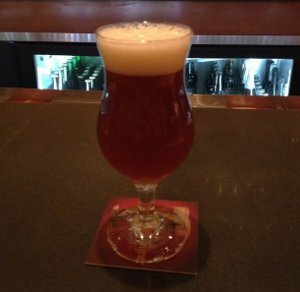 January Beer Club: Hoppy New Beer! Samuel Smith Winter Welcome Ale - I already reviewed this beer last month, but this bottle seemed a lot better than the one I had before. Not sure what the deal is there, but it was a better balanced brew than I remember, and certainly not a C. Maybe an upgrade to a B- is warranted. The Bruery Mischief - A classic. I reviewed this a while back, and it's just as good as it was the first time. Still an A and probably my favorite beer of the night. Port Brewing Santa's Little Helper - During a beer run in early December, I actually bought one of these (along with a few others) and put it on my passenger's side seat for the trip back home. At some point, I had to brake suddenly and my beer went flying... and this one broke open. I knew what happened right away, but since I was driving I couldn't really address it until I got home. For the next week or so, my car smelled of imperial stout... which, actually, wasn't that bad. 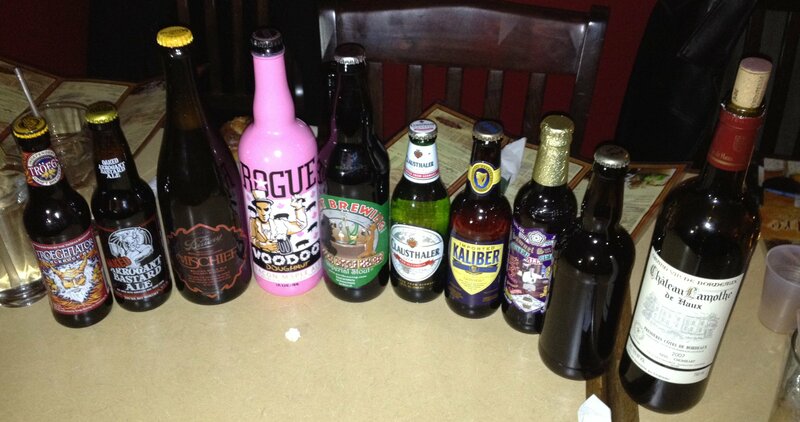 I eventually picked up another bottle, but never drank it, so I brought it to beer club. It's quite a solid imperial stout. Roasty aroma with a taste that features a lot of dark chocolate and roasted malts. It was quite good, though perhaps my taste buds were a bit shot at this point of the night, as this wasn't quite as great as I was expecting. I'll give it a B for now. 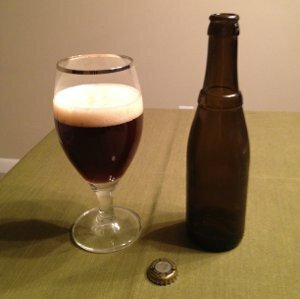 My Homebrewed Christmas Beer - I think this is perhaps my best crafted beer yet and other folks at beer club certainly seemed to enjoy it (it went pretty quickly, which is pretty gratifying). I keep saying this, but I should really do some reviews of my homebrewed beers at some point. Dana's Homebrewed Tripel - This did not come out as Dana had planned - there was a bit of a sour flavor present in the beer - but it actually turned out ok. Very citrusy nose and the taste, while not a typical tripel, was actually pretty good. And that covers all the beer that we drank. As always, a great time was had by all, and we're already looking forward to February. My first beer of the year and I may have just shot myself in the foot. I mean, yeah, January 1st just another day and our penchant for creating end of the year lists is an entirely arbitrary practice, but still. This sets the bar pretty high. 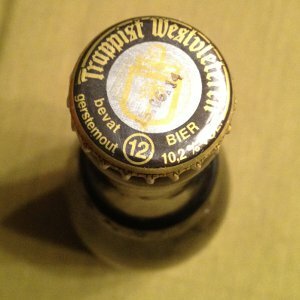 Trappist Westvleteren 12. The fabled Westy 12. Both Rate Beer and Beer Advocate have it ranked as the #2 best beer in the world, and it's been there for a long time. Indeed, it is often in the #1 slot, occasionally falling to a Pliny the Younger or Kaggen Stormaktsporter. In short, it's a legendary beer. Of course, it's impossible to get. Almost literally. To buy a case of it, you have to fly to Belgium and even then you have to jump through all sorts of hoops, calling the Monastery at the magic time, going to the secret pickup place at the secret time, doing the elaborate 42 step handshake with the attending monk, ducking below the booby traps (Only the penitent man will pass! ), then bribing the airport baggage handlers so they don't just "lose" your package, and so on. Apparently the monks also sell some bottles to their local cafes, so you can get one there too, but for most of us, the Westy is a pipe dream. Why do they do this? Well, the monks at the Saint Sixtus Abbey only sell their beer in order to financially support the monastery (occasionally, they will also use their earnings to support a charitable cause). This means not much beer is made, and apparently the local folks like this stuff too, so it sells out quickly. Go figure. Check out that bottle. You've got to love a brewery that's so badass it doesn't even need to put labels on their bottles. The only real identifier is the gold cap. Beer Nerd Details: 10.2% ABV bottled (11.2 oz). Drank out of a goblet on 1/1/12. The cap has a date printed on it that says 15.06.14. So is it the best beer in the world? Probably not, but it's up there. I mean, I've only had the one and it was superb, but I'd like to try it a few more times before I put the best in the world label on something. I suspect even then it wouldn't be at the very top of my list (though perhaps a top 10 slot would be fitting). Heresy? Maybe, but who really cares? When you get to beer that is this good, it doesn't really matter how you rank it. I've also got a bottle of the less infamous but just as hard to get Westy 8 that I'm hoping to crack open this weekend, so look for another review soon! Those who have attempted to leave a comment recently have no doubt found themselves facing a rather ugly error page despite the fact that the comment actually went through and was being displayed properly on the site. Sorry about that. In the short term, I've tried to make that error page a little more friendly so that you know what's what. This has been a problem I've been running into lately and is probably the result of my host attempting to deal with the massive throngs of spam comments that were attempted on this site (and on my generalist blog) a while back. It's a 504 error, which is apparently something of a scripting timeout, and yeah, I know, you don't care. So to make a long story short, if you submit a comment here, it should work, even if you get a weird page with an error on it. Also, I know it's annoying to have to log in with your Google or Wordpress (or whatever) account to leave a comment, but you can blame that one on the spammers too. I understand this is all a confusing state of affairs, and I assure you the appropriate person or persons responsible will be sacked. Unless that person is me, in which case, you're fucked because I'm pretty lazy about this stuff. I mean, come on, this beer isn't going to drink/review itself, amiright? Update: Playing around with some Module Caching settings. You may see some funkiness on the site. If something seems wrong, I suggest panic. So as we are all incredibly interesting people, and almost always drink beer, let's talk about what we drink when not drinking beer. Maybe your passion for coffee rivals that of craft beer, or it could be another alcoholic beverage such as Scotch. My daughter being a root beer fan would appreciate her dad reviewing a few fizzy sodas. Maybe you have a drink that takes the edge off the beer, be it hair of the dog or a palate cleanser during the evening. Well, leaving aside the beer blog roundup of posts that aren't about beer, I didn't have much trouble picking my poison. A few years ago, and I would have said Coca-Cola. But then my doctor told me I drank too much Coke. And I won a basket of Scotch and Cigars. Warning: What follows is a long and arduous tale of how I came to enjoy Scotch, followed by a beer review (said beer having been aged in Scotch casks). Feel free to skip ahead if my blabbering is putting you to sleep. Every year at work, we have a number of charity events, and for one of them, various teams put together a basket of goodies. People buy tickets and enter to win each basket. In the 7 or so years I've participated, I've won three times (the secret is to put your tickets in the bags with the least amount of tickets). There are always baskets of booze and beer, and they're usually among the most entered baskets, but the Scotch and Cigar basket only had one bottle of scotch, so I'm guessing folks went for quantity over quality, and so I won and thus began my interest in scotch (and to a lesser extent, bourbon). The Scotch I won was called The Balvenie. It's a single malt Scotch, but unlike most single malt Scotches, The Balvenie comes from a single cask (I'm no expert, but usually multiple casks are filled with the whisky from a single malt, then blended together). It's the 15 year old version, but it's got a nice fancy label with all the relevant dates and whatnot, and as luck would have it, my particular bottle sat in the cask for 18 years (it was casked in 1990 and bottled in 2008). At the time, I was a little intimidated by the world of fine Scotch whisky. I didn't want to waste this gorgeous and unique bottle of Scotch on an unrefined palate. Truth be told, it was right around this time that my beer geekery went into overdrive. I was learning a lot about beer, so I knew how different things could feel after you refined your palate a bit. So instead of cracking the Balvenie, I went out and bought some cheap Scotch. I started with a bottle of Johnnie Walker Black. A scotch whisky blend, and relatively cheap stuff with which to acquire a taste for scotch. My initial strategy consisted of pouring a little bit of scotch in a glass, then filling most of the rest with water. Yeah, if a whisky nerd ever reads this, their head might explode, but this is why I got the Johnnie Walker. I would have one of these every day, but each day, I would decrease the amount of water. After a couple of weeks, I was drinking it straight up (like a real, fire-breathing man!) and enjoying myself quite a bit. I finally cracked open The Balvenie and basked in its glory. During this period, my friend Padraic took pity on my scotch newbie soul and gave me the rundown (Padraic is a big beer nerd too, and he also maintains a blog about tea - quite the renaissance man!) He gave me a nice list of Scotches to try, and pointed me to a blog written by his friend Jacob called Water of Life (Padraic also contributes some reviews there). Thus armed with recommendations, I began exploring the world of Scotch a bit more. It's been slow going and I won't pretend to be an expert. Beer is my poison of choice and I've probably only had 7 or 8 different scotches in my life. I only recently figured out that Islay is pronounced "eye-wah". Speaking of which, I don't know much about the various scotch regions either (though Islay seems to be home to the peaty, smoky monsters of Scotch). 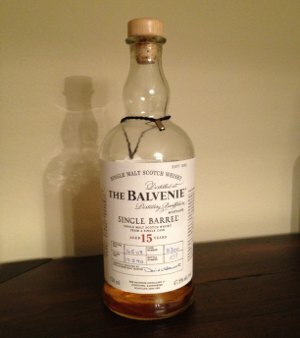 But I tell you now, every time I pour myself a dram of The Balvenie 15, I find my appreciation grows immensely. It is a really spectacular spirit, and I'm glad I still have some of it left. Oh sure, I could buy myself another bottle, but as it says on the label "Each bottle is unique and unrepeatable." But this is a beer blog, so to bring the subject back to beer, we'll naturally have to talk about Scotch barrel aged beer! I've covered a few of these, ranging from the sublime to the merely brilliant to the awkwardly balanced to the outright disastrous. 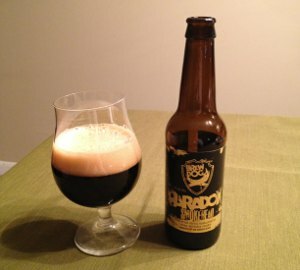 Today, I review one of Brewdog's now defunct Paradox series. An intriguing idea - they brewed up some imperial stout, then aged it in varying brands of Scotch barrels. This one was aged in Smokehead barrels. It's an Islay scotch, and apparently quite heavily peated, with lots of smoke. In my above referenced examples, Islay seems to overpower the flavors in beer, even in an imperial stout. But two examples isn't exactly a big sample size, so here's a third. Well, there you have it. I wish I had a bottle of Smokehead to chase this with, but what are you going to do. I have about 5 bottles of scotch in my little liquor cabinet with varying degrees of glory left in the bottle. Since this is a strong beer, I may have to forego the Balvenie tonight and hit up the newly acquired Ardbeg 10, whose Islay smokeyness knows no bounds. Someday, perhaps, I will do more considered Scotch reviews (they would definitely make great candidates for a double feature) here, but for now, this post will have to do. Update: The Roundup has been posted. As it turns out, I'm very unoriginal, as lots of beer folks apparently go for the occasional dram of scotch as well. Go figure. Did I say I only had 2 Christmas beers left? Turns out there were more. Rather than belabor the holiday beers, I figured I'd just finish them off, all in one post. So there you have it. That wraps up this year's Christmas beer blogging extravaganza. Regular beer blogging will resume next week, and boy did I have a doozy to start the new year off right! Beer Nerd Details: 9% ABV bottled (750 ml capped). Drank out of a tulip glass on 12/25/11. I don't really know what style to call this one. BA calls it a Belgian Strong Dark Ale, but it seems more like an American Wild Ale to me, so that's what I'm putting it as. In other news, Jolly Pumpkin is a brewery I should really become further acquainted with. So I bought this beer last summer. Damned if I remember why I bought it then, but I did. Heck, I've never even really heard of the brewery (as it turns out, they're a very small, semi-local brewery)... But it's been sitting in my fridge since then, and it actually seemed appropriate for New Years, so here we are. Why is it a New Years beer? When you hear the phrase "Holiday Ale" you're probably thinking about something that's Christmassy. Darkish beer with spices and/or lots of warming alcohol, with maybe the odd imperial red ale making an appearance. But there's definitely a different connotation for New Years. When it comes to alcohol, people tend to think of Champagne as the spirit of choice for that holiday. Jim from the Beer & Whisky Brothers blog recently laid out his 5 Rules for New Years Beer and while I normally find such proclamations kinda silly, I thought I'd play along anyway. Because I'm a silly guy, after all. Beer Nerd Details: 9.75% ABV bottled (750 ml caged and corked). Drank out of a goblet on 12/31/11. No date on the bottle, but I'm guessing it was bottled in late 2010. I had this beer last year and was quite taken with it. It didn't blow me away or anything, but it had a C+ on Beer Advocate at the time, which struck me as dreadfully underrated. BA seems to have upended the cart by using, like, 3 different rating scales now, none of which are the old letter grading system that was being used last year. Right now it's got a 74 (out of 100), which still seems awfully low. What have these 21st Amendment people done to inspire such ire? Is this beer made with the venom of an endangered species? Perhaps it's brewed solely with illegal immigrants in a sweatshop? Is this beer an elaborate money laundering scheme for mobsters? What's going on here? Beer Nerd Details: 7.9% ABV canned (12 oz). Drank out of a tulip on 12/24/11. Unfortunately no Fireplaces were available during consumption. There you have it. Up next on this brewery's front is Allies Win the War - 21A's collaboration with Ninkasi (with whom I'm entirely unfamiliar, as they don't distribute here). I bought one of the gorgeous 4 pack boxes of that beer, so I've already had one and quite enjoyed it. I'll probably be drinking another for actual evaluation purposes soon. As 2011 comes to a close, everyone and their mother is putting out top 10 lists and recaps for all manner of subjects, including beer. Here at Kaedrin, we're usually pretty lazy about it. Over on my generalist blog, I always put together a top 10 movies of the year list, but it usually doesn't come out until February. In that case, it's because I'm trying to catch up with movies on DVD/BD/Streaming/Torrents/etc..., but beer is a different matter entirely. For one thing, beer isn't released the way movies are, and while I've certainly had my fair share of one-off 2011-only brews, most of what I drank this year has been around for a while. So I've been lazily compiling a couple of lists, all based only on what I drank this year. As such, this post will be an intensely personal affair, entirely dependent on my 2011 consumption. Almost everything in this post will be represented in my archives somewhere, because as a true nerd, I've done a pretty good job about documenting the beers I drank this year. Before I get to my top beers of the year, I thought I'd spend some time musing on the trends of the year. Not necessarily trends of the whole craft beer world, just my own personal tastes. 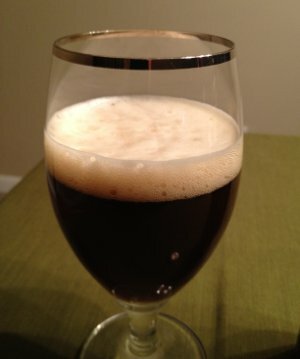 Stouts - When I began beer blogging a little over a year ago, I wasn't much of a fan of stouts or porters. But I forced myself to try some, and the more I tried, the more I enjoyed, especially when it comes to imperial stouts. There are still some varieties that I don't love, particularly stouts that emphasize coffee flavors (I'm looking at you, Founders Breakfast Stout), but I've really come to enjoy strong, dark beers over the last year. Aging/Cellaring Beer - As evidenced by a few recent posts, I've been toying with the concept of aging beer in my basement. Conditions are apparently not entirely ideal down there, but I tend to buy more than I can drink, so sometimes this happens by accident. I intend to cover the subject in more detail in a separate post (including a list of beers I'm currently saving), as it's an interesting practice. 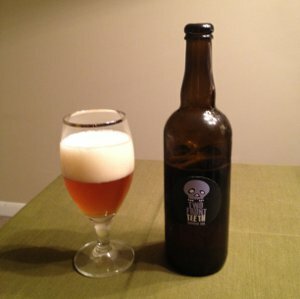 Homebrewing - I brewed 5 batches of beer in 2011. This roughly translates to once every 2-3 months and even that has left me with 3-4 cases of beer in my basement. I think my next step is to try making smaller batches more frequently. Speaking of which, I should really get cracking on my next batch! 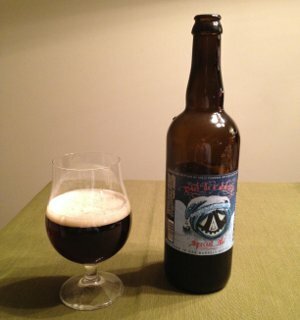 Sour Experimentation - I've really only gotten my feet wet with my exploration of sour beers. I've enjoyed a lot of what I've had, but only one has really knocked my socks off (the Sierra Nevada ExPortation). Expect more exploration in 2012, though I can't say as though these beers have really captured my imagination the way other styles have. 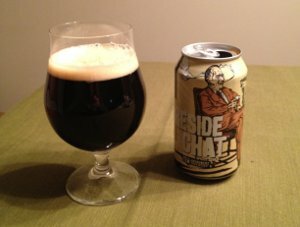 Finding my White Whales - When I started this blog, I was a little frustrated by reading about beers I could never find anywhere. Well, somewhere along the way, I started to get a sense for how to find me some white whale beers. My list of beer purveyors has increased significantly over the year, and the ridiculous PLCB rules notwithstanding, Philly is a pretty bitchin beer town. Well, there you have it. It's been a great year, filled with a ton of great beers. So great, in fact, that I couldn't quite bring myself to put together a top 10. I mean, seriously? I wrote somewhere on the order of 170 posts this year, and some of those contained multiple beers (including some with 10+ beers), meaning that I have somwhere on the order of 200-250 beers to choose from. Narrowing the list down to 30 was hard enough. All of the below beers have been reviewed, and I'm linking to each one. They're all at least an A- on my grading scale, and they're being listed from best to "worst", though I'd like to emphasize that the order is relatively fluid in my mind. Some of the beers on the bottom of the list could easily float up towards the middle or even top of the list, depending on my mood... Indeed, I could probably add another dozen beers to the list with no real problem. So take it with a grain of salt and if you want to see more, check out the A- archive. Bottom line, though, is that these are all exceptional beers in one way or another. It's no Beer Samizdat 100, but it's a start! Hopefully, it will be up to 50-60 beers by next year... In any case, this concludes my 2011 beer wrapup. Still a few more beers to be drunk, and I need to figure out a beer that fits New Years, but I'll include those in next year's recap (like I did above with Dupont's Bon Voux). Here's to a great 2012.